A culture hearth is a location that saw the origins of a culture from which it later spread. Culture Hearths are the centers of origin of ancient civilizations which continue to inspire and influence modern societies of the world today. According to historians, there are seven main Culture Hearths of the world. Certain conditions preceded the appearance of world’s Culture Hearths, all of them having common criteria such as a habitable climatic zone, the proximity of large river basins and geographical isolation from other regions of the world by mountains, deserts or seas. In relative isolation from possible attacks from the sea and from the invaders of the sparsely populated desert, the ancient civilization of the Nile River Valley was formed on the banks of the upper Nile River in Africa. In the summer and autumn months, the full-flowing Nile waters profusely fed the soil giving a rich harvest of millet and rye. Abundantly collected grain crops contributed to the population growth, which in turn led to the emergence of a hierarchy and the practice of knowledge accumulation via hieroglyph memos on tablets of wood or clay. Observations of the moon and the sun rotation cycles allowed the ancient Egyptians to form a pattern of time and calculate the number of days in the complete cycle of stars rotation. Early livestock sites dated to 8500 BC in the Indus Valley, but the cultivation of the soil began with more primitive tools of wood origin, images of which remained imprinted on the archaeological sites of the period. Rich moisture floodplain of the Indus River contributed to the development of a sedentary lifestyle, which required higher social organization. Later developed cotton processing encouraged the development of the earliest textiles. First commodity items inspired trade with other nearest civilization, located on the same latitude – the Fertile Crescent. Aryan migration with their cultural influence came to India around 1500 BC and coincided with the blossoming of the Ganges River valley civilization. The transition from a nomadic lifestyle to soil cultivation, or so called the Neolithic Revolution, occurred in the area of the Wei-Huang valley in China at about 5000 BC. Although the soil was quite fertile, floods recurred regularly, which gave rise to the need for the dams engineering, as well as transportation of large amounts of soil from one area to another. Up to 5000-3000 BC in the Wei-Huang valley territory, no major communities were built, but plenty of small village-like settlements were thriving. Trade relations triggered the appearance of elementary regulation, later grown into the centralization. It marked the beginning of the hereditary monarchies formation: Xia (ca. 2200-1750), Shang (ca. 1750-1100), Xia (about 2200-1750) and the Shang (about 1750-1100). A significant influence on the growth of future empire came from the Indo-Europeans, who introduced bronze and chariots to Yellow River people (as European called them) as well as other objects of the invention already common in Mesopotamia. Formation of the Zhou Dynasty (1122-256) is connected with the beginning of Chinese classical civilization. The wealth of literature of the Vedic period coincided with Aryans arriving at the Indian subcontinent. The literature also provides an idea of the social organization of Ganges Valley society. During the first centuries of Ganges civilization cattle breeding remained a major life provision activity. The large family community started to form during this time often with a confrontation between each other in pursuit of neighbor's cattle. The Sanskrit term gavisti reveals the essence of neighbors' tense relationships and has a common translation as war, but literally, it means "a chase in search of cows." The literature of that period boasts the names of certain clans and their achievements. The names of the most powerful clans of the Ganges civilization have passed the test of time and until now preserved as the names of the geographical regions of India. By the degree of ancient, Mesopotamia can be called next, known to some historians as the Fertile Crescent. This was the amalgam of traditions set forth for many centuries to come which has begun with the emergence of agriculture in the fertile soils of Mesopotamia around 8000 BC. One of the major early settlements was Jericho - the city with the longest history of continuous human habitation. Unified Egypt became the next milestone in the formation of a powerful cluster of culture and commerce in the area in the lower reaches of the Nile, north of the Arabian Peninsula and Mesopotamia. Due to the mapping similarity of the region with the crescent, the name of the Fertile Crescent came to use. Interestingly enough that in more recent time, this area was settled by Arabs of mainly Islamic religion, the symbol of which is also a Crescent. The movement of tribal groups in search of fertile land hemisphere began in the western hemisphere about 13,000 years BC. However, signs of early agriculture in the region of North America, which includes Mexico and Central America, the developed civilization with common cultural characteristics, began only at 7,000 BCE. Reportedly the cultivation of maize began about 4,000 years BC. However, all the soil work were carried out manually, due to the lack of large domestic animals in Mesoamerica, which in turn explains much later in comparison with other civilizations, the use of a wheel. 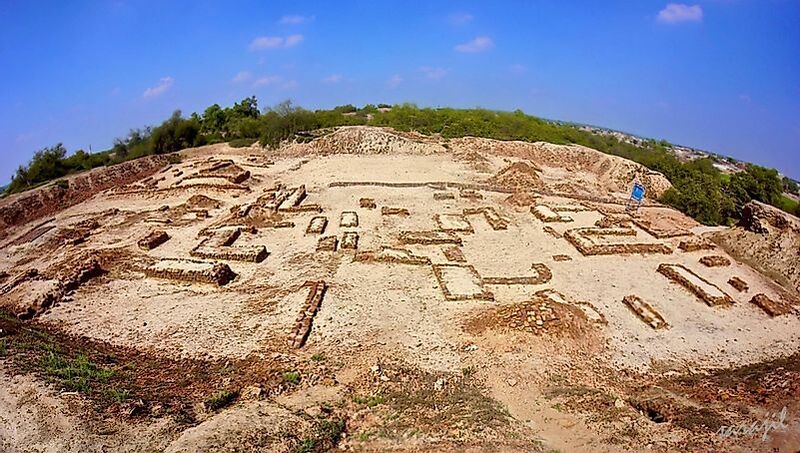 This fact probably also became an indirect cause of the absence of urban settlements, and the whole area was filled with rather small settlements. The symptoms of typical civilization emerged with the advent of the Olmec rulers at around 1200 BC, giving rise to the construction of expansive ceremonial centers, drainage structures, as well as the creation of colossal artistic objects - famous Olmec heads. The disappearance of the Olmec civilization for reasons still unknown was followed by the era of Maya. As early as 8500 BC the domestication of cattle in eastern Sudan took place, which at the beginning was a form of nomadic pastoralism. Around 7500 BC permanent settlements began to appear, the sorghum and yams were cultivated, adding each following century a new agro-culture. From around 5000 BC the territory became a host of small Sudanic monarchies such as Ghana, Mali and Songhai, and their ruling kings were usually regarded as the divine beings. Since then, the tradition has set forth to arrange the burial of kings, together with their servants. It was believed that the servants would benefit the kings in the afterlife. At about this cultural era the forces of good in nature and the human mind started to be represented in forms, images, and early texts tending to associate good with rain and fertility, considering it to be universally united divine power.